Traditional swing joints will cause the rotor to move back and forth as the elevation of the rotor is raised and lowered. While appropriate for natural turf installations, synthetic turf systems require a completely different approach. The best way to support the rotor's tremendous lateral thrust during operation is to place the rotor in a snug fitting hole within the vault's cover set. In order to set the rotor perfectly to grade and in this very specific location the swing joint must provide flexible movement in every direction, not only up and down, but also forward, backward, left and right. 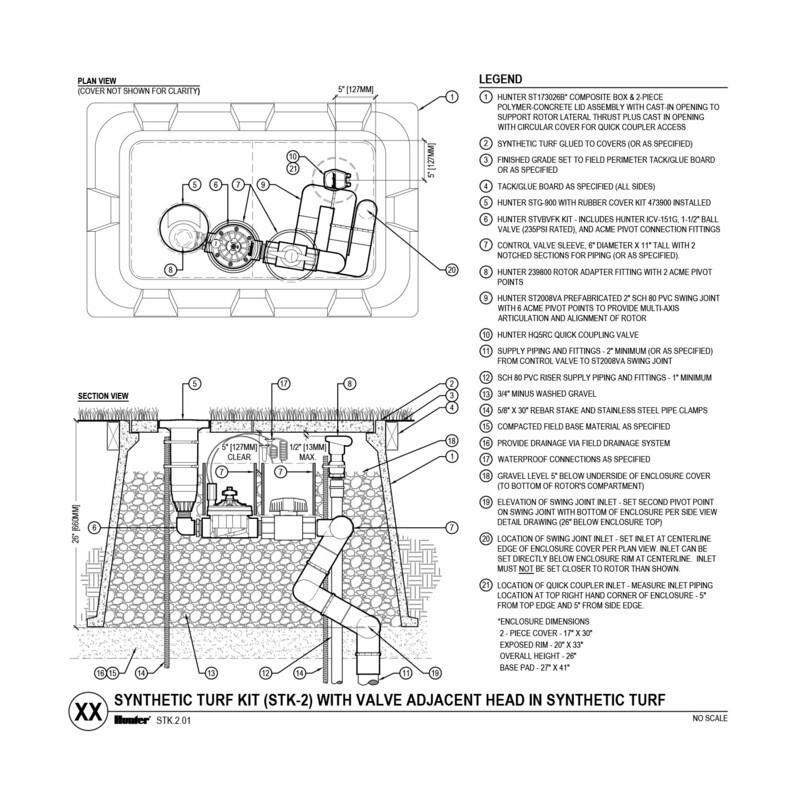 Ideally, this flexibility would include the ability to "reset" the elevation grade of the rotor should the enclosure settle downward during the vibratory compaction of the surrounding field base material. Enter the Hunter Vertical Alignment (VA) swing joint. Offering the ultimate in flexibility, our vertical alignment swing joint includes six pivot points for multi-axis movement plus a seventh pivot at the outlet for rotational adjustments of the valve and rotor assembly. 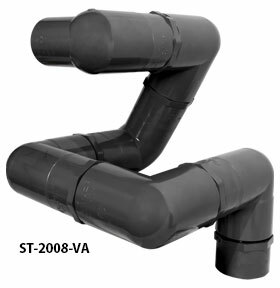 Constructed of rugged 50 mm (2") PVC pipe and fittings, this 21.7 bar; 2,172 kPa rated swing joint dramatically reduces dangerous water velocities and performance robbing pressure loss through the ST System's components. The Hunter ST vault's complimentary blend of features include construction grade fiberglass in the body, high impact polymer-concrete on the exposed upper rim and a near indestructible polymer-concrete cover set. 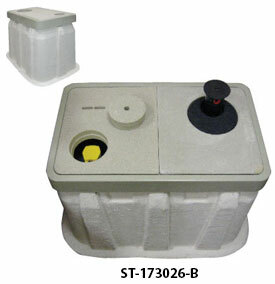 Together, they form a 9,000 kg+ rated enclosure that is durable, yet easy to install at 47.6 kg with the covers removed. The exclusive 51 mm thick three-piece polymer-concrete cover set has a perfectly located cast-in hole for the STG-900 rotor on one side. This design allows the rotor to be held perfectly to grade within the hole while the enclosure is back-filled from the exposed opposite side. 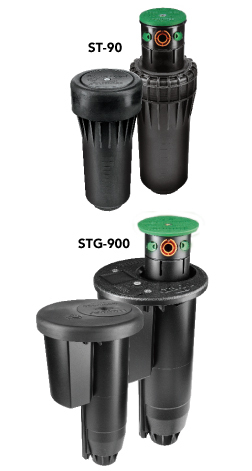 Quick couplers are a must-have around every synthetic field. The cast-in quick coupler port and cover on the opposite side eliminates the need for separate quick coupler enclosures around the playing field. Have you ever tried to bore a hole into polymer-concrete? It is near impossible. How about installing and setting a 180 kg. polymer-concrete enclosure? Not very much fun. For others, the preferred approach is to use valve-in-head (VIH) rotors. 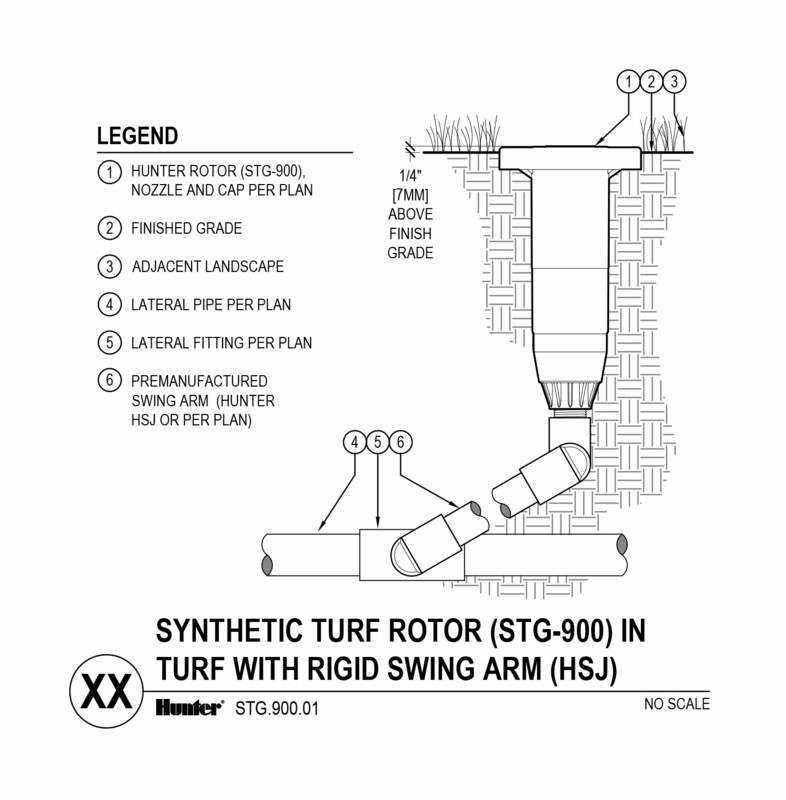 However, typical VIH rotors have an unacceptably high-pressure loss at the high flows and pressures that are inherent in all synthetic turf irrigation systems. As a result, the Hunter ST System utilizes a valve adjacent to head (VAH) configuration. This design lowers the pressure loss down to a very acceptable 0.7 bar; 70 kPa at 22.7 m3/hr; 378 l/min through the valve assembly.